PDF to PDF/A Converter is a powerful converter which is designed for converting normal or scanned PDF documents to PDF/A-compliant documents. With the help of PDF to PDF/A Converter, you can convert your PDF files to PDF/A for ensuring that your documents will be achievable and display reliably. VeryPDF PDF to PDF/A Converter is a powerful converter which is designed for converting normal or scanned PDF documents to PDF/A-compliant documents. With the help of PDF to PDF/A Converter, you can convert your PDF files to PDF/A for ensuring that your documents will be achievable and displayed reliably. It quickly and easily converts documents worthy of retention into PDF/A, also verifies conformity of the result with the ISO standard. VeryPDF PDF to PDF/A Converter is a software for converting PDF documents into the PDF/A format for long-term archiving. The tool analyzes and converts the input document, applying a digital signature where required. This software is both robust and scalable, making it suitable for integration in various processes such as standardization, quality assurance and archive migration. Support input formats of all PDF versions, from 1.2 to 1.7. Convert PDF to PDF/A-1b format. No need for other PDF viewer or editor software. Support to edit PDF descriptions including title, author, keywords, subject, creator, and producer. Option to set initial magnification degree for PDF Open Action. Able to set the first page to be displayed in Open Action options. Automatic and configurable embedding of color profiles when device-dependent color spaces are used. Automatic and configurable embedding of fonts: Embed as a subset to keep the file size small or embed the entire font to enable file post-editing. Automatic creation of metadata or embedding of metadata from external sources. PDF/A compliant electronic signature with embedded trust chain, time stamp and revocation information. Linearization for fast web view. Convert PDF to PDF/A. VeryPDF PDF to PDF/A Converter allows you to convert your existing PDF documents (normal or scanned) into fully searchable ISO 19005-1 and 19005-2 compliant archivable documents. This helps to ensure that you can find the right document when you need it, and that it will appear the same way it did when you archived it. Using VeryPDF PDF to PDF/A Converter to convert your PDF files to PDF/A helps to ensure that your documents will be searchable, display reliably and be archivable. Convert Multiple Documents. 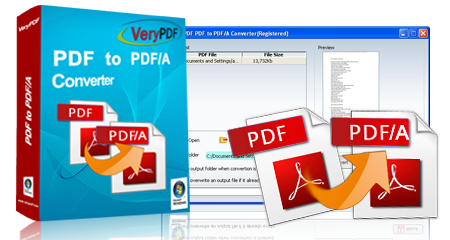 You can use VeryPDF PDF to PDF/A Converter to convert multiple PDF documents to PDF/A. This allows you to easily prepare large groups of documents for archival.